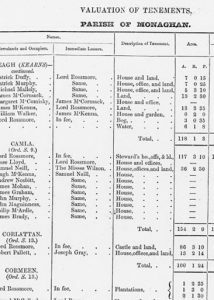 While no complete set of census returns survives for a period prior to 1901, there are two records which provide a partial substitute – one of them being Griffiths Primary Valuation Records.This was a survey of the land and property carried out between 1847 – 1864, for purposes of local taxation. Here you will discover the names of all occupiers of land and buildings and of the persons from whom these were leased, the amount of property held and the value assigned to it. Available online at www.askaboutreland.ie and in bound books at all libraries in County Monaghan.